A junked outboard motor makes an excellent power plant for a cycle car when converted as described here by Mr. Cole. The little car will develop speeds up to 40 miles an hour, and has power to burn. My boy had just reached that stageâ€” only more so. He begged me to build him some kind of vehicle that would “run by itself.” Since I like to putter around and make thingsâ€”particularly something different from the other fellowâ€”I gave ear to his pleadings, and began to think the matter over. An electrically driven car suggested itself, but nothing less than a 32-volt motor would be satisfactory, and the batteries for 32 volts would be heavy and make the car cumbersome to handle. An idea! Tucked away in a corner of my garage was an out-of-date light-twin outboard motor. It was out-of-date only because it lacked the power of its present-day cousins. Nowadays an outboard under 10 h.p. is strictly passe in water motoring circles, so the little “putt-putt” had been retired from active service. Why not drive a cycle-car with the outboard motor? The idea took tangible form and developed. The ultimate result was a practical and dependable miniature motor vehicle. So dependable, in fact, that “the boy” ventures far from home with itâ€”used it on a two weeks’ camping vacationâ€”and delights in climbing all the hills in the vicinity-â€”and there are some hills. 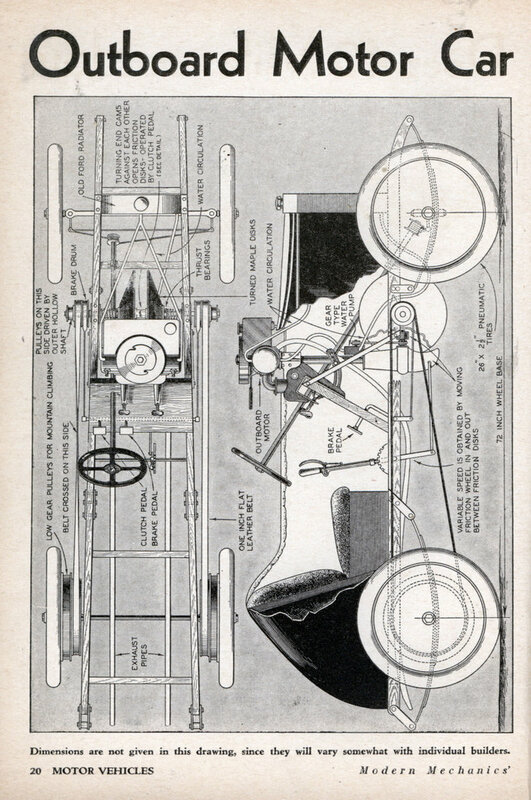 The drawing shows the plan and elevation of the unique car. The sketches are not offered as detail construction drawings that the prospective builder must conform to, but rather to show the general outlines of such a car, and to illustrate the means by which the outboard power is converted to traction use. In building an outboard cycle-car, the design of the chassis depends upon what material is available to the builder. To lay down exacting specifications might run up the cost beyond a reasonable amount. The first thing to do is to build a substantial chassis with a 72″ wheel-base and a 30″ tread. For the frame rails, 1-1/4″x 2″ oak or ash is recommended. Old auto spring leaves from a junk-yard will afford spring suspension. Single master leaves are sometimes sufficient for each cycle-car spring. Old motorcycle wheels are especially good. Ordinary bicycle wheels can be used, or strongly constructed baby-carriage wheels. The wheels should be not less than 20″ in diameter. To the rear wheels are bolted double-faced pulleys to receive 1″ flat belts. These pulleys should be of such diameter as to give respectively 6 to 1 and 3 to 1 gear ratios between the driving and the driven pulleys. These pulleys can be turned from -maple, preferably laminated, or a sheet metal worker can spin them. The method of attaching them to the wheels depends upon the style of wheels. The constructor must decide this for himself. Suitable steering gear must be installed and be mounted so that the steering column will not interfere with an outboard motor set vertically on the centerline of the chassis. At a point a little ahead of the middle of the chassis, a transverse board is securely mounted across the frame and tilted forward about 60Â°. This serves as a mounting for the outboard motor the same as the transom of a boat. An old Ford radiator or any other small car radiator, acquired cheaply at an auto-wrecking yard, is mounted on the front of the chassis. Provision must be made for water circulation, but the detail of this will be taken up later. We now come to the very essential unit of the cycle carâ€”the transmission. A second drawing shows this in detail. The drawings are practically self-explanatory. The main shaft is of 3/4″ cold-rolled rod. One friction disk is secured rigidly to this shaft. The other disk is locked to a tubular shaft made of 1″ iron pipe which turns on the main shaft and also in its own shaft hanger. Anyone with a home workshop lathe can turn out the friction disks and the drive pulleys. The bushings and the thrust bearings can be picked up in an auto junk-yard for a few cents. Front wheel bearings from an old model Ford will serve as suitable thrust bearings. Stiff valve springs from a scrapped heavy-duty motor will serve as tension springs against the friction disks. Provision must be made for oiling all the bearings. It is necessary that the friction disks be spread apart to permit the entry of the friction drive-wheel between them. This is done by turning two end cams against each other, as shown in detail. One cam is held stationary by attaching its lever to a rigid part of the car. The other is turned against it by depressing the left foot pedal. The right pedal contracts a brake-band around the face of the pulleys on the transmission shaft.. The transmission assembly is supported to the frame in shaft hangers, as shown in a detail. These hangers are made of maple, bushed and reinforced with 1/8″ steel plates. Their construction is obvious. A friction drive wheel replaces the propeller on the propeller drive shaft of the outboard motor. The exact design of this wheel will vary with different makes of motors. A very satisfactory way to make the wheel is to obtain a broken and discarded propeller from a marine supply store, and turn this down to a cylinder with a flange and a small pulley for the pump drive belt. A steel washer 2-1/2 ” in diameter is fitted against the flange, then a group of rubber disks are slipped over the hub and built up to about 1-1/4″ thick. These are held securely by another washer and pressed firmly in place with the propeller shaft nut. Most outboard motors depend upon their movement through the water to maintain water circulation around the cylinders. When used for other purposes, mechanical circulation must be established. This can be done in a number of ways. The method shown in the sketch is one of the simplest. A small gear-type pump is mounted to screws on the drive-shaft housing, and is driven by a 1/4″ round belt from a pulley turned on the rebuilt propeller hub. These pumps can be had at an auto junk-yard. A number of old cars used gear pumps to maintain oil circulation. If one has an old outboard motor, the rest of the cycle-car can be built up cheaply ‘ by a good shopper at auto junk-yards. Studying the drawings will give the prospective builder a clear idea of the fundamental construction. A speed as high as 40 m.p.h. can be had on the level in high with a 2 to 3 h.p. motor. As a retired Master Sergeant US Army. I have never in my life seen anything like it. Only in an Americaâ€¦I think I will build one just so I can say I have something that no else has. Maybe you could cross the belts. Seeing as how the illustration on page 1 (magazine page 20) has the note on the left edge “BELT CROSSED ON THIS SIDE” it shouldn’t have taken you 3 posts. I know what you’re talking about, I looked real hard at that before, but in the drawing there’s no certainty that both of those discs turn the axle. No certainty EITHER will turn it, actually. I take exception to the statement “The drawings are practically self-explanatory.” That statement is totally belied by the next statement: ” The main shaft is of 3/4? cold-rolled rod. One friction disk is secured rigidly to this shaft. The other disk is locked to a tubular shaft made of 1? iron pipe which turns on the main shaft and also in its own shaft hanger.” You don’t see the 1″ pipe in the drawing, there’s a vague mention of one pulley being turned by it. The idea is that one friction disc is merely an idler when the car goes forward, and I think I see the suggestion that this one SUPPOSED to provide the reverse, but I don’t see how the 1″ is engaged while the 3/4″ is disengaged. The article says there’s also supposed to be a detail drawing of how the end cams work for the clutch, but I don’t see it. If you could move the friction wheel forward and backward, you would have a “Continuously Variable Transmission.” Those were the original automatics, and they’re making a comeback. A CVT doesn’t just have 4 or 5 gears, it has the full range of ratios inbetween. The idea is to have a centrifugal clutch engage at a minimum rpm and then the friction wheel moves from the outside of the discs to the center as the car picks up speed, with the engine actually maintaining a constant RPM rather than varying up and down with the shifts. Electric and gas engine carts that they run around the mall on, snowmoblies, many things work on these, and there’s even a few cars on the market with them again. But I doubt this car was built even by the writer or the magazine staff at the time. 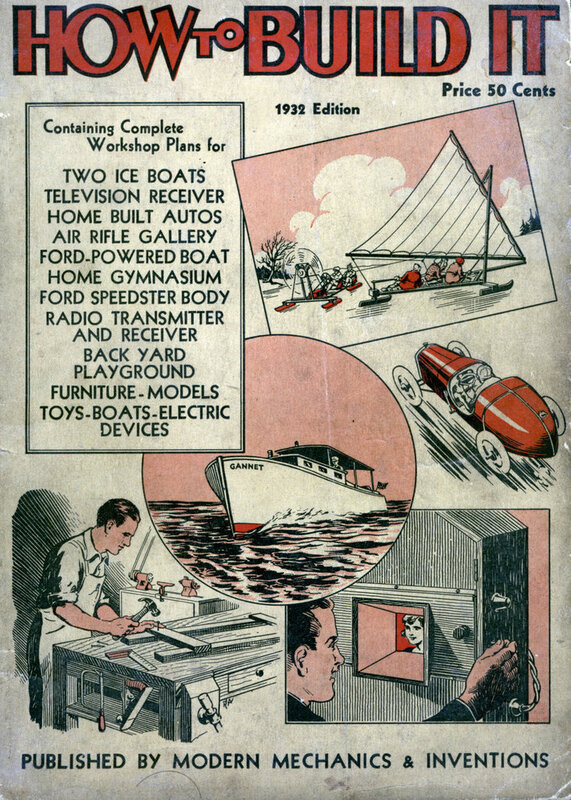 There were many ideas put forth in how to magazines that proved half baked and unbuildable once in print. Read the article on the ‘Speedball Special’ elsewhere on this site, and you see they attempted 5 unsuccessful designs before succeeding at building the 6th. I doubt any kid ever had the chance to race around at 40mph in one of these. If Dad ever did complete something inspired by this article, I’ll bet it was largely his design by the time it was finished. But picture if the dad DID build it with the rear wheels going opposite directions, and didn’t catch it before the testdrive. And a 3hp pocketbike at probably less than have the gross weight with rider struggles to get to 30mph. Even if you build in the proper reduction into the drive train for the car to be capable of 40mph, at 2-3hp it will take a long time to reach that speed. From a standing start it would probably lose a dragrace with a good bicylist. Oh, and what keeps the crossed belt from rubbing as it crosses in the middle? Nothing. It’s called a cross belt drive, you see them all the time.